Gillian Thornton followed the banks of the river Lot – one of southern France’s most picturesque rivers. From my lofty lookout high above the rooftops of St Cirq-Lapopie, the Lot snaked languidly away into the distance, a blue ribbon weaving between thickly wooded slopes. I’ve always had a soft spot for this beautiful riverside community classified amongst France’s Most Beautiful Villages for its half-timbered medieval houses, Renaissance homes, hilltop churches and vestiges of an ancient castle, the latter my panoramic viewpoint on a sunny summer’s afternoon. 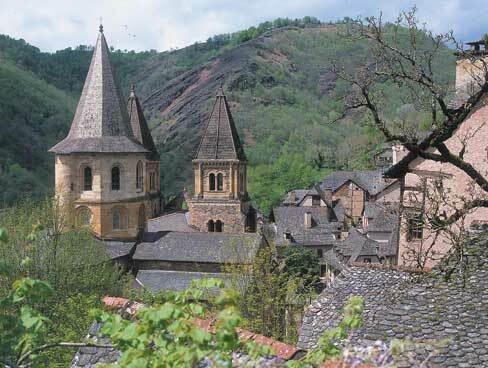 A real jewel of the Lot Valley, St Cirq-Lapopie is one of those enchanting places that lingers in the mind long after the suitcases have been emptied and put away. But travel along the valley and you’ll enjoy a whole host of experiences to re-live and share over and over again; and all so easily accessible – just head due south from Brittany, cross the Dordogne and you’re there. The Lot’s journey begins more than 1200 meters above sea level on the slopes of Mont Lozère, meandering westwards for 500 dramatic kilometres through a striking mix of landscapes: the high plateaux of the Aubrac, the dense forests of the Margeride, steep limestone gorges, and fertile farmland covered in vineyards and orchards. 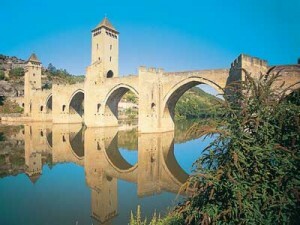 Along the way it crosses the regions of Languedoc-Roussillon, Auvergne, the Midi-Pyrénées and on into Aquitaine. The river ends at Aiguillon where it joins the mighty Garonne after passing through the départements of Lozère, Cantal, Aveyron, Lot and Lot-et-Garonne. 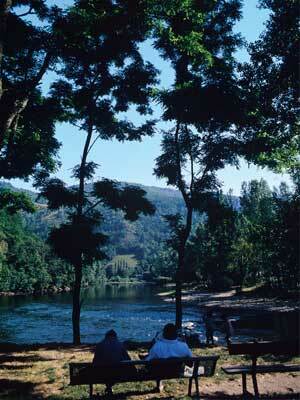 Whatever your taste in holidays, you’ll almost certainly find it in the Lot Valley. The river is navigable for around 150km, mostly through the départements of Lot and Lot-et-Garonne, including the section beneath my lookout at St Cirq-Lapopie. Departing from Cahors or Bouzies, you can enjoy a cruise excursion with commentary, or pilot your own boat for a leisurely few days. If you prefer pedal power, hire a bike and take the path beside the river, or book a cycling package that includes themed trails and accommodation. For walkers too the Lot Valley presents some of the most scenic and historic trails in southern France. The source of the Lot, on the slopes of Mont Lozère, is close to Bleymard – a village visited by Robert Louis Stevenson and mentioned in Travels with a Donkey in the Cévennes, one of his earliest works, published in 1879. This sparsely populated and wildly beautiful area is famous for its myths and legends, including that of the Beast of Gévaudan, a giant wolf which terrorized villagers in the 18th century. But don’t let such a tale prevent you from visiting the Gévaudan Wolf Park at Sainte Lucie near Marvejols. Travelling west, the Lot passes through Mende, capital of the Gévaudan in the Middle Ages and now county town of the Lozère département. See its magnificent cathedral, narrow cobbled streets and pretty riverside houses. From here the river crosses the departmental border into Aveyron, skirting the southern fringes of the Aubrac Plateau, where honey-coloured cows with soulful eyes outlined in black graze summer pastures strewn with flowers. Stop off at Laguiole, home of the world-famous knives. 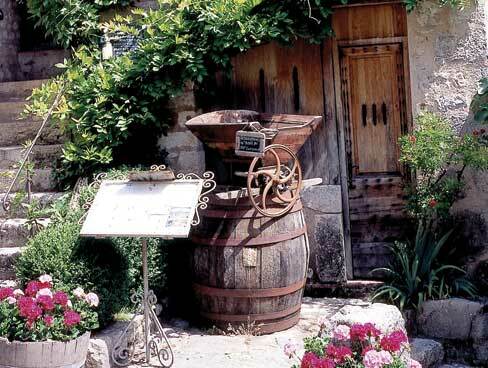 Then drop down into the Pays d’Olt and discover traditional villages such as Saint-Eulalie d’Olt and Saint-Côme d’Olt, rich in medieval streets and buildings. This is pilgrim country – an extremely picturesque section of the UNESCO-classified Compostelle trails where long-distance walkers carry a symbolic shell on their backpacks. For information on shorter local circuits, ask at any Tourist Office. At Entraygues, the Lot is joined from the north by the Truyère (known for its dramatic gorges), each river spanned by a medieval bridge. From here on, the Lot becomes navigable by gabarre – traditional flat-bottomed boats once used to transport commercial goods towards the Atlantic ports. West of Entraygues, the river flows across the south of Cantal through the Châtaigneraie, a protected area of chestnut woods, dotted with pretty villages such as Marcolès and Montsalvy. A detour to the county town of Saint-Flour will be well rewarded: Gothic cathedral, Renaissance courtyards, buildings of Auvergne lava, and deeply relaxing wellbeing treatments at Chaudes-Aigues – at 82º Europe’s hottest natural springs. Yet another of the Lot Valley’s many highlights is Conques in the Aveyron – one of France’s Most Beautiful Villages, with quaint streets, ancient buildings and a stunning Romanesque abbey. Ask at the Tourist Office about guided tours of the abbey’s upper galleries along the nave, and see the gold relics in the Treasury. Entering the département of Lot, the river flows close to Figeac, a fascinating town on the banks of the Célé packed with historic buildings spanning many centuries. But the highlight for me is the museum dedicated to François Champollion, the first man to decode Egyptian hieroglyphics on the Rosetta stone. The town was his childhood home, and the Musée Champollion tells not only the story of the man himself but also that of writing and communication across the world. 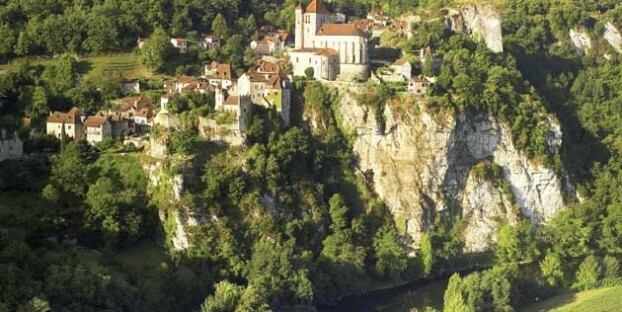 The pretty valley of the Célé flows down towards the Lot through Cabrerets, a riverside community best known for the Pech-Merle caves and prehistory museum. Here you can see primitive wall paintings dating back 20,000 years – hand prints, human figures, bison, horses, antelope and even the fossilised footprints of prehistoric children. No matter how many times I visit, this is always a humbling experience. The Célé joins the Lot just beyond St Cirq-Lapopie, the water cutting through the limestone plateau beneath sheer cliffs in dramatic loops, one of which virually encircles Cahors, the county town of the Lot département. See the cathedral and the turreted Valentré bridge (both listed by UNESCO) and the edible and craft souvenirs at the lively produce market. Beyond Cahors the Lot approaches the last stages of its journey, into Lot-et-Garonne and the region of Aquitaine. 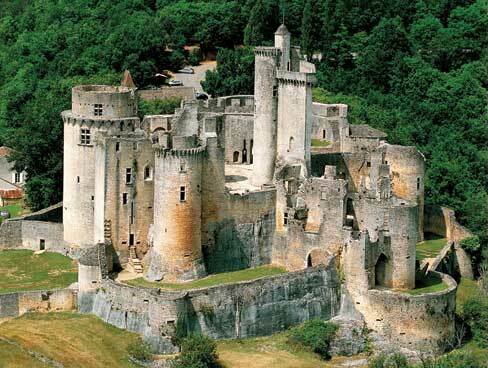 En route it has passed many imposing fortresses, but few as impressive as Château de Bonaguil, a classic and atmospheric Renaissance castle brimming with towers, turrets, drawbridges and defences. In summer months knights in armour and other costumed characters play their part in a programme of themed events and demonstrations. Beyond Bonaguil the landscape of the Lot’s long passage gives way to fertile farmland. The last major town on the river is fortified 13th-century Villeneuve-sur-Lot, retaining not only its defensive towers but beautiful timber-framed houses and central square so characteristic of medieval bastide towns. The bustling traditional market, a holiday treat, is on Tuesdays and Saturdays. And the town’s picturesque old bridge and the Bout-du-Monde chapel make for another very memorable holiday shot. Bastide towns are still a striking feature of this corner of south-west France, built by both the French and the English as commercial centres surrounded by ramparts and accessed by fortified gates. 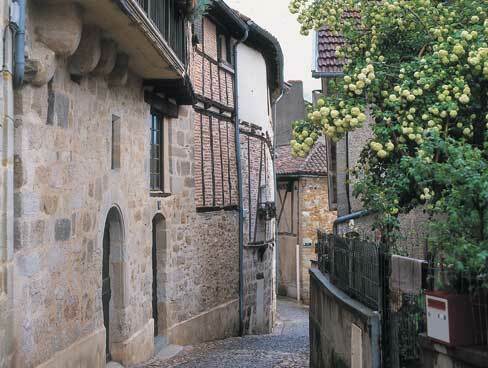 One of the best preserved is nearby Monflanquin, where a unique museum showcases the history and development of these medieval ‘new towns’. Finally, the Lot merges into the Garonne just beyond Aiguillon. The road to Berre Hill gives panoramic views across the twin valleys. Wherever you travel in the Lot Valley, delicious local food products and traditional dishes are guaranteed to tempt your taste buds. The mountains of Lozère, for instance, are famous for their charcuterie and ham, and in the Châtaigneraie region of Cantal you can enjoy the wonderful flavour of pork from pigs fed on chestnuts. Try Aligot – classic dish of the Aubrac plateau. A puree of tomme cheese, it was once the staple food of local shepherds. Another traditional Lot Valley dish is estofinado, a mix of dried unsalted cod combined with potatoes, eggs and more crème fraiche. Elsewhere along the valley you’ll find foie gras, Agen prunes, saffron, sweet strawberries and a variety of delicious cheeses such as Cantal from the Auvergne and Pélardon from Lozère. Naturally, such irresistible fare cries out to be accompanied by a worthy local wine. 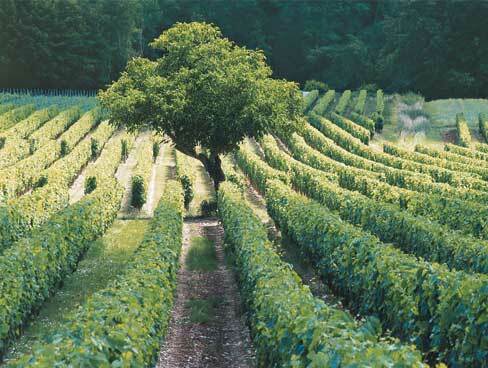 Entraygues, Marcillac and Conques all produce small quantities of wine, Marcillac’s full-bodied red awarded AOC status. But the most famous of Lot Valley wines are those from Cahors which can trace their roots back to the Middle Ages. To discover Lot Valley food, produce and products at their freshest, just browse the stalls at any local market. Then find a table, relax and savour those distinctive and delicious flavours – holiday food at its very best!